STOCKTON, Calif. (August 30, 2017) – The Port of Stockton today announced that Port Commissioner Dr. Elizabeth Blanchard has been named President of the Association of Pacific Ports (APP) for 2017-18. The appointment was announced at the recent 104th Annual Conference of the APP held in American Samoa. Her tenure as APP President officially began August 1. The Port of Stockton also announced that it will host the 105th Annual Conference of the APP July 15-18, 2018. 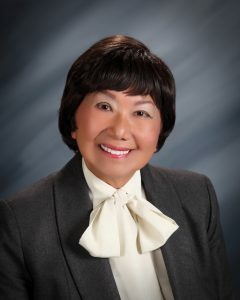 Dr. “Liz” Blanchard has been involved with the APP since she was named Port Commissioner at the Port of Stockton in 2008. She has been serving on the APP’s Executive Committee since 2010. Dr. Blanchard also is the current Board Chair for the Port of Stockton. Dr. Blanchard holds a doctorate in psychology from the University of the Pacific and is a retired Professor Emeritus of the San Joaquin Delta College Psychology Department and the University of the Pacific School of Education. She also is currently President of the Disabled American Veterans Charities of San Joaquin County. Dr. Blanchard also currently serves on six other community and organization boards and served for eight years on the Stockton City Planning Commission and for two years on the San Joaquin County Planning Commission. Founded in 1913, the APP is a trade association that provides education and information to promote the efficiency and effectiveness of Pacific Ports. APP programs are designed to enhance the technical capabilities and governance expertise of port officials through meetings, seminars, and the exchange of information.